Home » B Titles » Spider-Verse Team-Up #2: Good, But Does it Matter? 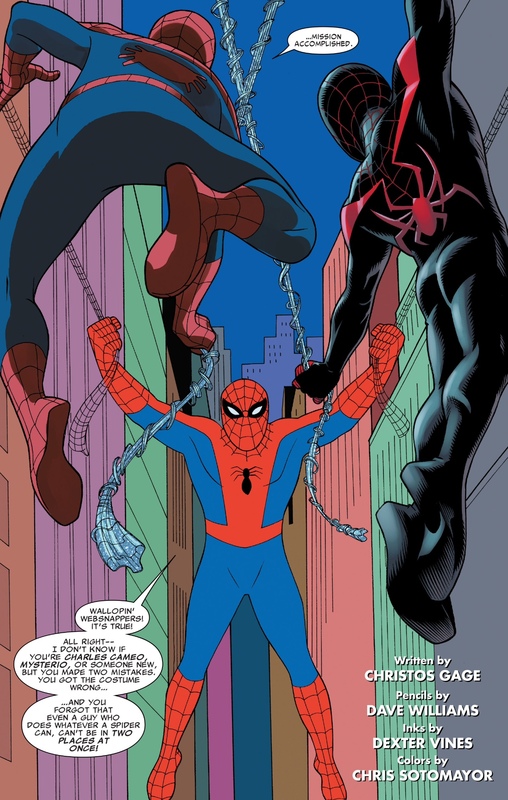 I still wish that the short little vignettes we’ve been getting in the first two issues of Spider-Verse Team-Up would somehow play a more consequential role in the larger “Spider-Verse” narrative, but I also can’t deny that this miniseries continues to deliver fun and entertaining stories that further flesh out some characters that are otherwise being glossed over in the main arc. 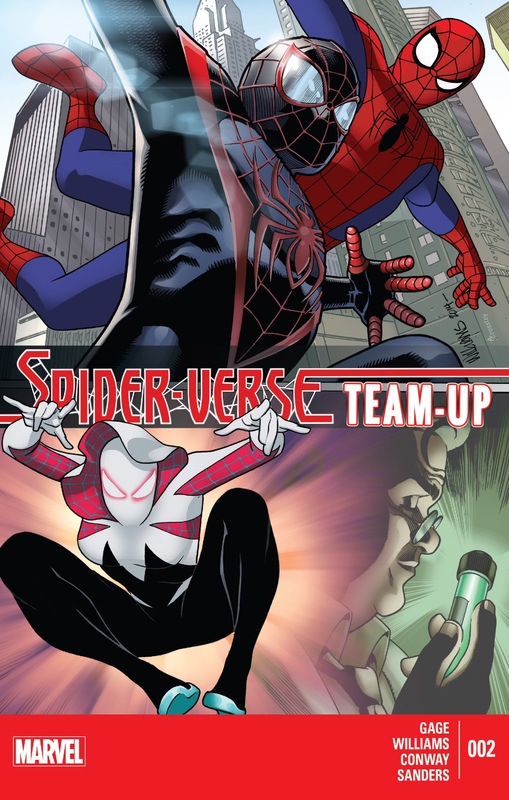 Plus, unlike some other “filler” books we tend to get for events like “Spider-Verse,” Spider-Verse Team-Up has been recruiting some fantastic writers from the world of Spider-Man past and present. Christos Gage is back for another round in a charmingly funny team-up involving Miles Morales, the Ultimate (cartoon) Spider-Man and Spider-Man from the 1967 cartoon, while comic book legend Gerry Conway (just don’t let him hear you call him that), gets to tackle the newest sensation (and the woman he famously killed) in Spider-Gwen. The fact that Marvel and Spider-book editor Nick Lowe are getting creators with a real, honest-to-goodness history with Spider-Man demonstrates that a tremendous amount of care has gone into developing this miniseries, and it’s not being regarded as some kind of quick cash grab by the “House of Ideas.” It’s just that no one in their right mind who has been reading comics during the Dan Slott era on Spdiey thinks that something significant is going to happen within the confines of this book. 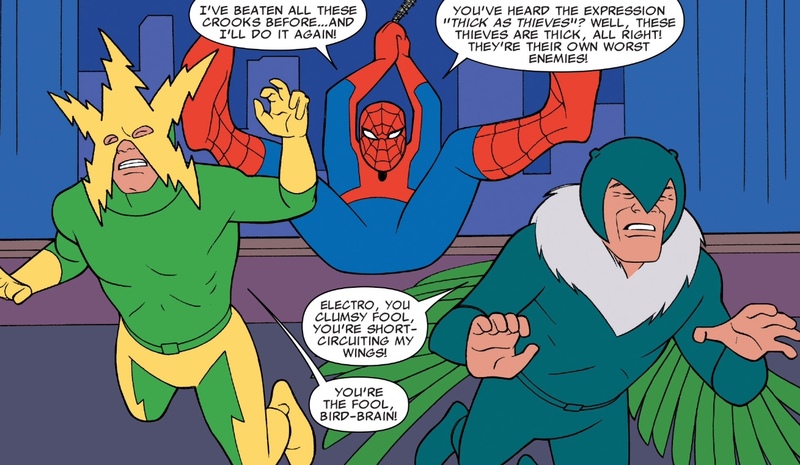 That’s really the only knock on Spider-Verse Team-Up I can think of right now. Gage’s “Too Many Spider-Men” send-up of Spider-Man ’67 hit upon so many things that are both endearing and loathsome about that terrible, terrible cartoon. After receiving the complete set of episodes of Spider-Man ’67 last Christmas, and being the father of a three year-old who always wants to watch these DVDs (not because he likes Spider-Man, mind you, but just because he likes that catchy theme song), I’ve become quite well versed in that series – probably more than a man my age should be. And Gage’s story just knocks it out of the park, from the commentary on Spidey’s half-drawn costume, the overall garish color scheme of the universe, J. Jonah Jameson’s over-the-top characterization (which set the stage for J.K. Simmons to go even further in the Sam Raimi films), and the ridiculous villains like Dr. Noah Body. And despite the overall absurdity of Spider-Man ’67, Gage still manages to demonstrate the character’s potential worth in the Spider’s war against the Inheritors. A part of me was quite worried that this “babe in the woods” was going to end up being Inheritor food before the tale was all over, but it appears that he’s received at least a temporary stay of execution. If I had any complaints in “Too Many Spider-Men,” and this criticism can be applied to the entire “Spider-Verse” event, it’s the under-utilization of Miles. Maybe it’s just because Miles’s creator, Brian Michael Bendis, hasn’t had any role in “Spider-Verse” whatsoever, but this wonderfully unique character has been depicted as being two-dimensional at best in all of these early appearances. As Marvel’s second “main” Spider-Man behind 616 Peter, one would think he would play a far bigger role than just a semi-background character who cracks a few jokes and raises eyebrows from his fellow Spiders because of his ethnicity and skin color. Hopefully Miles gets a little more special treatment going forward, but there hasn’t been any indication that the storyline is heading in that direction. Conway’s “A Spider in the Dark” is a far more serious story than Gage’s pastel-colored romp. But it’s an absolute joy to watch Conway get a chance to write a new iteration of a character who he has historically derided as being rather bland and boring. Obviously Conway was talking about the 616 version of Gwen, the character he unceremoniously killed in the what is arguably the most historic comic book story of the past 50 years, and not Marvel’s newest sensation, Spider-Gwen. Still, a part of me was eager to see if Conway was going to fully buy-in to the Spider-Gwen hype in how he wrote her. 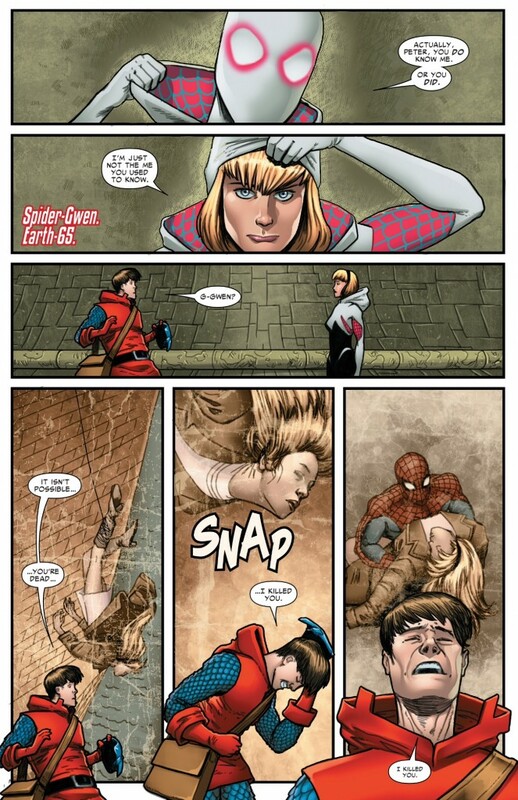 Conway undoubtedly does the character justice, and at the same time, draws some more parallels between her life as a hero and the 616 version of Peter Parker. 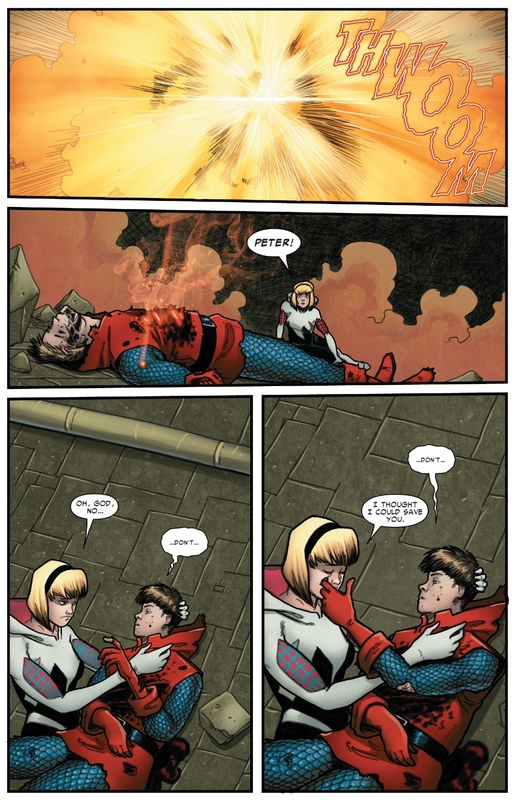 In Gwen’s world, she fails Peter, causing him to transform into the Lizard and die. In this story, she travels to Earth-21205 to see another iteration of Peter, who has cast himself as the Hobgoblin because of the grief and torment he felt for not saving his world’s Gwen. Like our Peter, Spider-Gwen appears to be destined to not be able to save the ones she loves the most, and the cruelty/irony of how Peter is essentially her world’s version of Gwen is just a fantastic emotional element to emerge for this character. However, Conway ends his story on a beat that’s both hopeful and saddening as Hobgoblin-Peter sacrifices himself to save Gwen, and manages to avoid being “eaten” by the Inheritors in the process. I expect that the final issue in this series will continue on the same trajectory – I believe Tom DeFalco will be returning to write a Spider-Girl feature, which is sure to be a good time. I don’t know if there’s an easy solution as to how to make a book like this “matter’ more in the grand scheme of things, but maybe the next time Marvel plans another mega Spider-event like this, they can let some of the fantastic talent get a crack at writing/illustrating a story that impacts the main narrative.